Comment Nordstrom motive ses vendeurs en boutiques ? Brett Blake runs a million-dollar business selling men’s clothing. His most valuable asset isn’t the building or the merchandise. In fact, he owns neither. He isn’t even in management. His secret is his client list and his capacity to mine it. He is one of 50 Nordstrom employees who each surpassed the $1 million sales mark during the last fiscal year. The elite “million-dollar club,” which includes the company’s top performing employees, boasts 20 more sellers this year — the largest ever. The increase comes as Nordstrom’s overall financial performance has strengthened: The company’s sales rose 8.6 percent to $6.5 billion during the fiscal year that ended Jan. 31, and its comparable store sales for the year was its highest in a decade. While internal improvements (such as the company’s new inventory tracking system) and external factors (a recovering economy) have bolstered the company’s performance, its longstanding emphasis on customer service has also played a role. Employees such as Blake, who works at Nordstrom’s downtown Seattle store, are encouraged to cultivate personal relationships with clients, take care of customers as they see fit — essentially operate their own businesses within the larger company. “We are at our best when we are defined by a salesperson,” said Erik Nordstrom, executive vice president of full-line stores who noted that some customers come to the department store specifically to buy from their favorite employee. The top seller throughout all of Nordstrom — Chris Sharma, who works in men’s furnishings at Tysons Corner Center near Washington, D.C. — sold more than $1.6 million last year. That’s more than some small companies generate annually. Nordstrom employees, who earn 6.75 percent commission, on average, can potentially earn six-figure salaries on sales of more than $1 million; employees typically bring home around $32,000, the company’s national average. Those who make the million-dollar club earn an additional 1 percent commission for one year after reaching that milestone. Lynn Mahlum, who works in the women’s Narrative department at Nordstrom’s Southcenter store, sold more than $1 million in merchandise for the first time this past year — increasing her annual sales by about $300,000 in just one year. She joined the company 13 years ago during a summer sale, bringing with her retail experience from her family’s Federal Way gift shop. Mahlum, 49, estimates that she has at least 1,000 customers, whom she regularly contacts with information on sales or new products. One time a woman from Eastern Washington called the department store as she was on her way to the airport, Mahlum recalled. The woman had forgotten her daughter’s coat at home. Mahlum picked out some coat options and met her at the store door for a quick purchase. “It makes you feel good to be able to help people like that,” she said. Mahlum and Blake are the only local Nordstrom employees to make it into the club this year. Blake, who has worked for Nordstrom since 1993, has been a member of the million-dollar club for the past five years, selling more than $1.17 million this last fiscal year. He keeps track of his daily sales in a calendar so he can compare his performance to previous months and years. He also maintains a client list of several hundred shoppers on a home computer database. At least four times a year, he mails letters to his clients, notifying them of special events. He sends handwritten thank-you notes to new customers. “I get a lot of the credit for it, but really I’m just one of the many people on the team,” he said, explaining that he relies on other departments within Nordstrom, like the tailor shop, to serve his customers. Aaron Sparboe travels to Seattle from his home in Billings, Mont., two or three times a year specially to shop with Blake, who sends him fabric samples of suits, ties and shirts. Of all the employees that Sparboe has encountered at high-end retailers, Blake is among the best for customer service, he said. Not only has he helped Sparboe with merchandise outside of his department, he’s even made restaurant reservations for Sparboe when he is in town. “If I need it he’ll find it for me,” said Sparboe, who estimates that he spends at least $30,000 a year with Blake. Elaine Seike relies on Mahlum for her fashion needs. One day she called Mahlum in a panic — it turned out that an event she would be attending in a few days was a black-tie affair. When Seike arrived at the Southcenter store after work, Mahlum had pulled outfits for her to try on and stayed late to help Seike pick out a black dress. Although employees at upscale stores like Neiman Marcus might be able to compete with Nordstrom’s customer service, not many retail employees are as driven to generate sales because they don’t work on commission, said Patty Edwards, managing director at Wentworth, Hauser & Violich, which tracks the company’s stock and holds 485,000 Nordstrom shares. “They really control their paychecks,” she said, noting that Nordstrom employees will often make an extra effort to help their customers. While she lived in Alaska, for example, the company’s employees in Seattle would send her care packages of clothing that she couldn’t find up north. Another reason for the increase in the number of top sellers at Nordstrom in the past year: improved merchandise. The company’s new perpetual inventory system can track how items are selling — or aren’t selling — enabling merchandisers to keep tabs on customer preferences. Nordstrom has also brought in new designers to some of its stores, Edwards noted, and added fresh merchandise not available by other retailers. 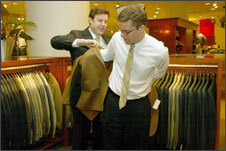 Larger industry trends — such as a return to formal office wear like suits — have driven sales at the company as well. Nordstrom continues to implement technology upgrades to assist its sales force. It has added new cash registers that interface with Nordstrom.com; if a particular product is not in the store, employees can order it for the customer online. The company is also rolling out an electronic version of the employees’ personal book, in which workers keep clients’ names and phone numbers. A pilot program was launched at the Tacoma store in February. Even with such improvements in technology, though, the company remains focused on the personal aspects of the business. During Nordstrom’s annual “state of the company” meetings with employees, executives highlight a list of goals of the company to achieve, Erik Nordstrom said. Improving customer service is always at the top. “You never achieve it and check that off the list and move on to the next one,” he said. The company will recognize the achievements of its million-dollar sellers next month, treating them to a trip to Seattle and dinner at a Nordstrom family member’s house. In reaching the million mark, Blake, who is in his “late 30s,” has helped some customers who purchased more than $10,000 at one time. But, he said, the job is about meeting customers’ individual needs, not the sale amount. “There’s nothing, nothing better than when a client comes in and asks for you,” he said.